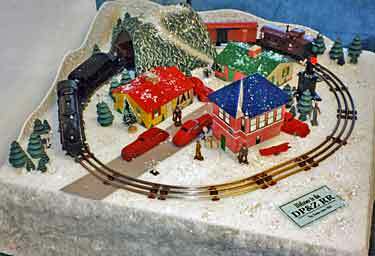 This month starts the annual Holiday Season of celebrations calling for festive display layouts — usually pizzas (circles of track that may or may not come in a box). 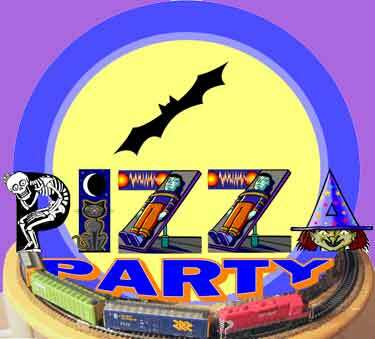 Here are a bunch of inspirational pizzas, including two Halloween lines and each major scale/gauge in current use! 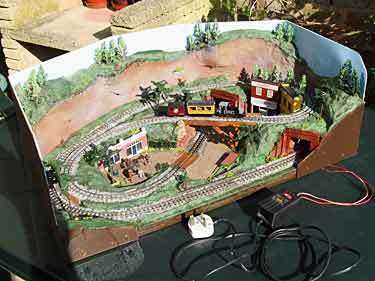 To accommodate G-scale trains on his 5½in (14cm) radius curves, Chris built a 4-2-0 “bent” chassis (lower right) with electrical pickup at the front bogie (leading truck) to run the motor on a Playmobil R/C chassis with plastic wheels. 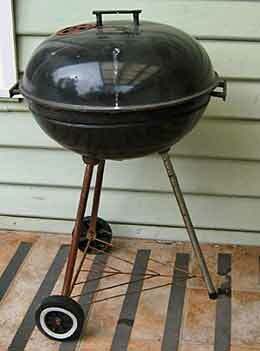 The wagon/coach chassis are also trapezoidal. 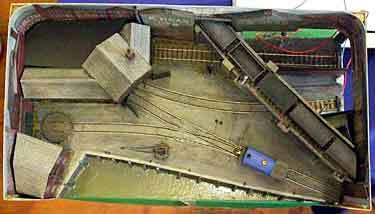 It’s an ingenious layout from all angles! 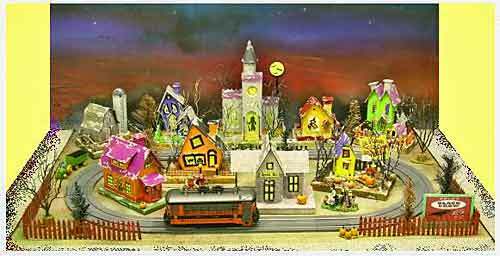 Howard Leroy Lamey, from Jacksonville, Florida, USA, has been featured many times in these pages for his nostalgic, holiday “glitter houses.” This year Howard has expanded his reach to include a Halloween display, Spook Hill, featuring a Lionel “Transylvania” trolley (tram) car running on Superstreets track amid some appropriate examples of Howard’s excellent cardboard buildings. 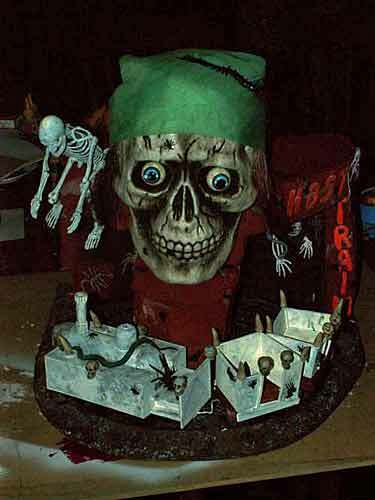 To top it off, his website includes instructions for making your own Spook Hill buildings! 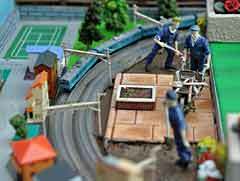 T Gauge, with a track gauge of 3mm and a scale proportion of 1:450, is the smallest available commercial model train scale. 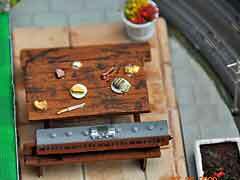 It’s made by KK Eishindo in Japan and is perfect for very small pizza layouts, as no turnouts are currently available. 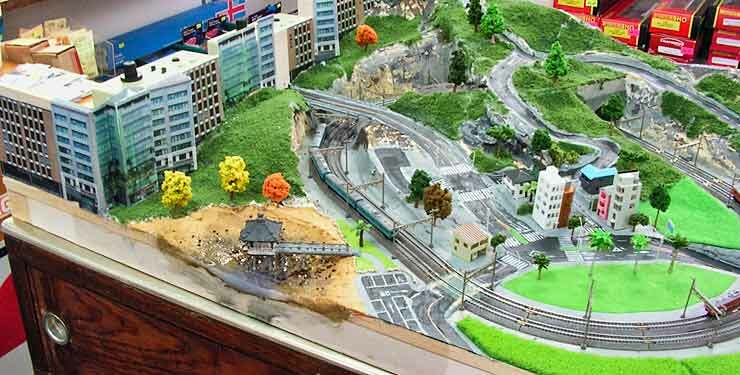 Darren Hodges, from Stratford, Victoria, Australia, created this 40x60cm (16x24in) T layout to use in his hobby shop, Hobbies Plus, in Stratford. Darren built the base and terrain formers of balsa covered with aluminum screening. 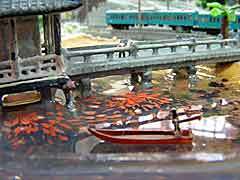 Most structures and accessories are from KK Eishindo. There’s a photo album of the construction process posted here and a video here. Juan Palacio, who lives in Hialeah, Florida, USA, has built two pizzas in microscopic scales. His Z work (above) measures 8½x11in and fits in a wooden stationery box. His N pike (right) is 10¾x15½in. More info at his blog and YouTube (Z and N). 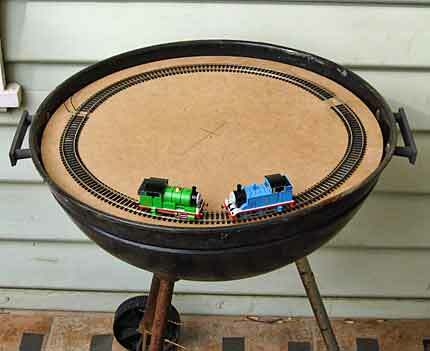 Rather than build two pizza layouts in different scales, Australian Darren Hodges opted to use an ingenious way of building both scales into the same layout! 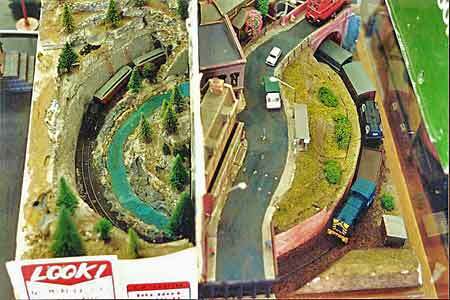 The result (left) is a pizza display that simultaneously can operate both N scale and British OO scale trains! 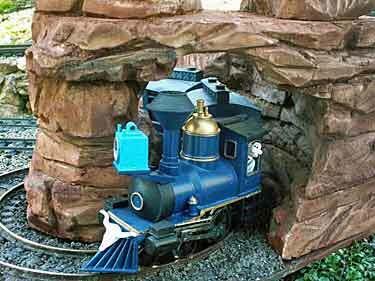 (In a pinch, I suspect he can also run HO trains on the same 16.5mm tracks as the OO!) Although the photo shows how the trick is done, it’s probably easier to understand via Darren’s video below. Just click on the triangle to see the action. Victor Smith, from Pasadena, California, USA, first showed us his 9x10in (23x25cm) HOn30 pizza in Scrapbook #23 (above left). Recently he acquired an XTS Train System set, which runs on 9mm gauge, and decided to try it out on his old pizza layout. It worked! 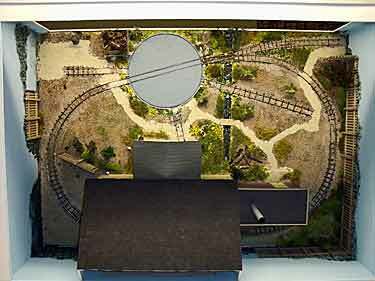 So he rebuilt the HOn30 locomotive structure on the battery-powered XTS mechanism and refurbished the Wild West look of the layout (above right). Results are pictured below. 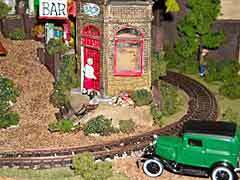 The battery-powered train will run anywhere, and the scenery demonstrates that a well-detailed pizza can amply reward a long, close examination! For other display layouts based on XTS mechanisms, see Scrapbooks #45a, #51, and #80a. 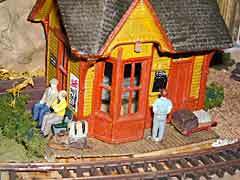 David J. Rooke, from Westcliff-on-Sea, Essex, England, built the TCC Tourist Railroad some 30 years ago. TCC originally stood for Television Cabinet Central, as the 71x43cm (28x17in) was built to fit inside an old plywood TV cabinet (which has long since vanished). 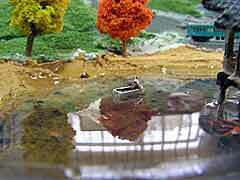 But David recently restored the layout and built new scenery for it, with the result shown here. The plan is a “folded dogbone” that looks more like a spaghetti layout than a pizza, but we include it here because it is a continuous layout with no turnouts and somehow seems to fit. 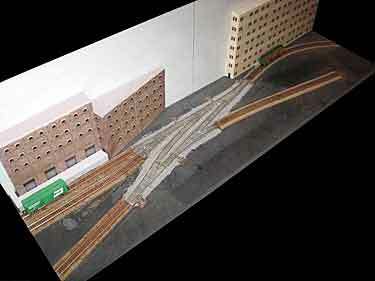 The nicely refurbished layout is for sale. 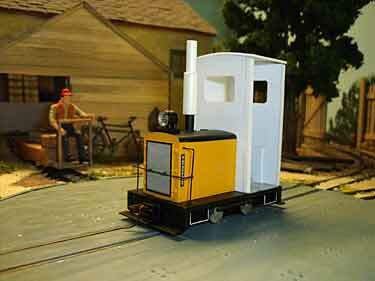 OO9 is the most popular narrow-gauge scale in Britain—4mm scale running on 9mm gauge. Ken Jones, from Birmingham, England, has a penchant for building pizza layouts in various containers and a variety of scales (see his website for many interesting examples). 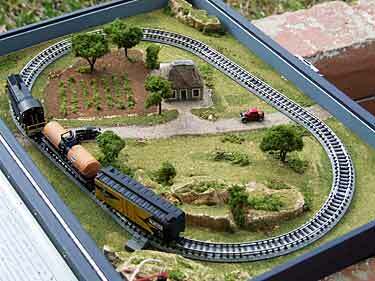 Here’s one of his latest creations—a garden railway in British O scale (7mm to the foot running on 32mm gauge), using T gauge trains to represent a large scale line with about 5in gauge. The container is a wooden cutlery box he found on eBay, measuring 18x13in (45x33mm). I particularly like the “football field” style of lawn mowing! 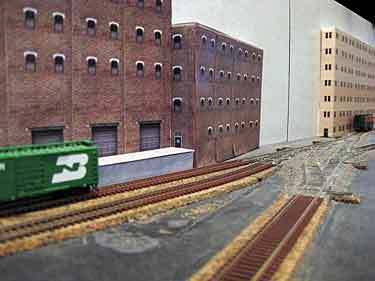 “The layout operated smoothly all through the afternoon and was a big hit, especially with the folks who were into collectibles and the model railroaders.” Harry’s layout, the DP&Z Railroad, measures 37in (94cm) square. The fertile mind of Norway’s Jon Songøygard has captured yet another towering idea. Inspired by Andrew Milner’s Summit layout in Scrapbook #84a, Jon started with a Gn15 pizza having a 20in (51cm) diameter, then thought about stretching it upward… WAY up! At the higher level, he envisioned an O9 circle, about 10in (25cm) in diameter—the reduction in scale serves to “force perspective” and make the mountain look much taller than it actually is. The result—a very attractive (but very tall) dual-gauge pizza. 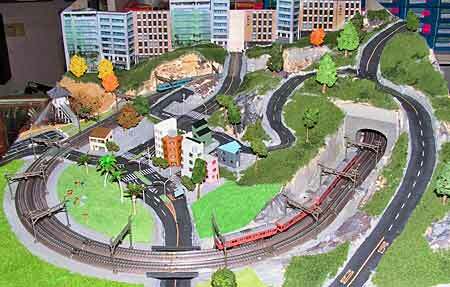 The overhead photo (below left) shows the simple track plan used for this attractive layout. It no doubt was inspired by Bott’s Cotton Gin Tram and the SAP Line from this site. Operations are very flexible with this track plan. 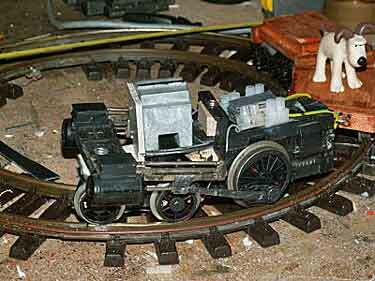 Hubert is converting a Bachmann On30 Davenport gas-mechanical loco model to Gn15 using Evergreen styrene (lower right). 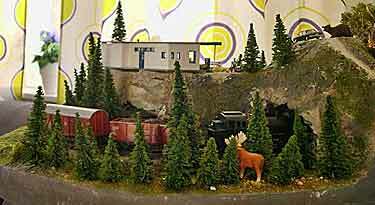 He’s also one of the H’s in H&H modelbouw hobby shop in Gouda. Just browsing and what a fabulous display of brilliant engineering and real artistic talent.